Who remembers the chocolate bar Ice Breaker? It was one of my favourites when I was a child, but for some reason it didn’t stay the course and was discontinued after only a few years. Milk chocolate filled with mint cracknel pieces. What’s not to love? Thankfully, I’ve now discovered how to make my own. This recipe for peppermint cracknel chocolate also contains toasted coconut for an even greater wow factor. I made these peppermint cracknel chocolate sticks with toasted coconut to give to friends who’d invited us over for dinner. We hadn’t seen them in far too long and I was looking forward to a good catch up. A few weeks earlier I had borrowed The Chocolate Cookbook by Christine France from our local library and I spotted this exciting mint cracknel recipe in it. The right opportunity to make it had arrived. If you don’t mind making caramel, this is a relatively easy recipe to have a go at. It only requires four ingredients too. 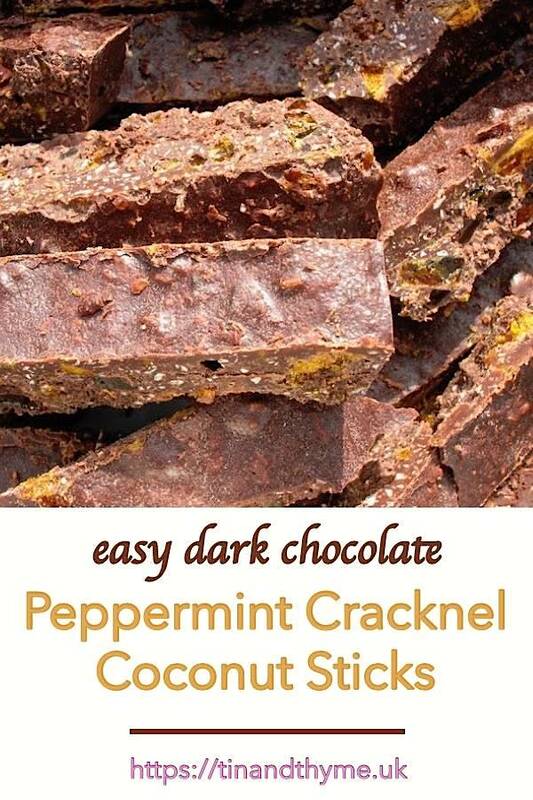 Shards of peppermint cracknel and toasted coconut combine to make this chocolate crunchy, chewy and utterly delicious. These peppermint cracknel chocolate sticks make for a very moreish snack or you can tie them up in pretty bags to give as gifts to friends and family. When I say sticks, my peppermint cracknel chocolate was more like chunks. I’d made them too deep, so that when I tried to cut them, they just broke any which way; they were not going to be made into the delicate slim sticks I’d envisaged – ho hum! I used a 2lb loaf tin to set my chocolate in. I’ve opted for a wider container in the recipe below, so that you’ll end up with something rather more refined. Despite the technical hitch though, the end result was pretty good: nil points for presentation but 9 out of 10 for taste and texture. The tasting panel seemed to agree. If you’re vegan or wanting dairy free chocolate for any reason, do please ensure that the chocolate you use is actually vegan. Dark chocolate shouldn’t contain any dairy, but many brands can’t guarantee there aren’t traces to be found. Just leave it out. You could also just make the peppermint cracknel without adding any of the other ingredients. Use it to decorate a minty cake or just munch as is. Making caramel can be tricky. I’ve come a cropper with burnt sugar in the past and it isn’t nice, so do keep your eye very closely on the pan whilst it’s cooking. I favour the non-water method, which I find much easier to manage. Plus you don’t need a sugar thermometer. Melt the sugar in a pan over medium heat until it’s liquified. Let it bubble for thirty seconds to a minute until golden. Take it straight off the heat; it will continue to cook in the pan for a little while and should turn a lovely caramel colour. If you want to use the water method, the original recipe states to add ¼ pt water with the sugar. But it’s best to have a thermometer if you go down this route. Shards of peppermint cracknel and toasted coconut combine to make this chocolate crunchy, chewy and utterly delicious. Place the sugar into a pan over a medium heat. Watch it carefully until it's liquified. Allow it to bubble for thirty seconds to a minute until it's turned golden. Remove from the heat. It will continue to cook and go a lovely caramel colour. If it doesn't, return the pan briefly to the stove. Add the peppermint oil, stir and pour onto a piece of baking parchment. Leave to cool and harden. When set (this should only take a few minutes), break into bits, then roughly crush with the end of a rolling pin. Carefully toast the coconut in a frying pan over a medium heat until golden, stirring all the time. Allow to cool. Melt the chocolate in a bowl over a pan of hot, but not boiling, water. Stir in the coconut and mint cracknel pieces. Pour into an 8" (20cm) sq. silicone mould or lined tin and leave to set. Cut into sticks with a sharp knife. If these are destined as a gift, place into a cellophane bag, label and tie with a bow. If you're able to temper the chocolate, it will look better and last for longer. For even more recipes for homemade chocolates, head over to my Chocolate to Love board on Pinterest. Thanks for visiting Tin and Thyme. If you make these peppermint cracknel chocolate sticks with toasted coconut, I’d love to hear about it in the comments below or via social media. Do share photos on social media too and use the hashtag #tinandthyme, so I can spot them. For more delicious and nutritious recipes, follow me on Twitter, Facebook, Instagram or Pinterest. Peppermint Cracknel Chocolate Sticks. PIN IT. I like the sound of the peppermint cracknel and I like the rustic look of your bars. Looks like proper homemade treats. I wouldn’t have thought of putting mint and coconut together, but it sounds as if it worked for you. Perhaps setting the chocolate in a larger tray would help with neater cutting – for when presentation is important. My Mum used to make something similar to this but without the mint. It looks delicious. Brings back memories and can just imagine the incredible aromas when you open up that tin! Fabulous looking recipe, as ever. ooh. I wish I could be on the tasting panel for these. Wow! I have never heard of cracknel before. Personally, I like the rather tattered and rustic look! Ah you see, I think that presentation looks lovely…but then I’ve always been a chunky fan. I’ll bet they tasted deeelicous! I like the sound of this. I am of to buy peppermint oil and vanilla sugar and hope to give it a try very soon. I will let you know how it goes. These look delicious. I love the chunky bars! Hey, my hubby (another chocolholic) does not give a hoot about what his treats look like…as long a chocolate is a primary ingredient! But, I understand, as a blogger, that nil for presentation is not what you’re going for. These look pretty darn good to me, though. Love the name! Must try this, they sound the perfect treat to have with a cuppa. Your friends are so lucky!!! Never heard of cracknel before, sounds like a great treat..loving the flavor of mint in it..must be refreshing and delicious! Absolutely delicious chocolate bar. First time here, lovely recipes. Just found your blog! Healthy + chocolate recipes? Yes, please! These look really good. All the ingredients sound like they were made for each other. Presentation doesn’t matter if they tasted as good as they sound! Suelle – yes it did seem an odd combination, but it worked fine, although the coconut was more texture than taste. And yes, a larger pan would probably have been a good idea – in retrospect! Maggie – this could work with lots of flavours I think, or just leaving it with the coconut would be nice. Jill – thank you. Yes, they did smell rather gorgeous. Corina – it would be fun to have a blogger gathering to try out each other’s goodies. Pudding Pie – thank you for liking my chunks. I really like coconut and chocolate together too. Hazel – thankyou. Rustic sounds good, not quite so sure about the tattered! SewHappy – do let me know how you get on – hope you like it. I used vanilla sugar but the original recipe was just for straight white sugar. Baking Addict – thank you. I think I’ve come around to the chunky look now. Suman – yes, definitely refreshing – a good after dinner treat. Cook in a Bar – thank you for your kind words and thank you for the award. Sensible Vegetarian – thank you for visiting and for kind words. Mary – thank you and thanks for explaining about the corn. I knew about blue cornmeal but not white. Jackie – thanks for kind words and thanks for following. All that I’m Eating – thank you. I think the appearance is definitely in its favour. What’s the point of making something homemade if people think it came from Tesco? This looks beautiful and chic. Wow, these sound really nice and very moreish! Maria – thank you. If I hadn’t given them away, I think I could have eaten rather too many. Celia – thank you. I shall heed your wise words and enjoy. Ooooh now this looks fabulous!!! What a fabulous tongue tingling combination! Did you add the 1/4 pint of water at any time? No, I find making caramel without water easier, so I didn’t use it. The original recipes did though.